“On another thread, Beth Haynes asked how others could also get published. interested in writing and who also wants to publish OpEds. 1) Get in the habit of writing regularly, preferably daily. news story) every day — even if it’s short. called a “standing order” in my mind to always look for something to say. Plus it gives me a chance to practice formulating my ideas. points succinctly, typically in response to someone else’s article or OpEd. theme and then explain/defend it with reasoned arguments. context of ideas that isn’t necessarily shared by the average American. someone like that in your own set of friends and family. I try to aim my writing for that person. where I needed to better understand an issue myself. those ideas to the best of our ability. minds than mine (like Rand and Peikoff) have already done that hard part. We just have to work to understand them and then work to communicate them. culture far out of proportion to our otherwise small numbers. already aware of that philosophy have to be willing to make that case. and that our government should leave them free to do so. once wrote, “There’s nothing as powerful as an idea whose time has come”. did we?” But only if we actually *act*. We have a golden opportunity to shape the future in the direction we want. 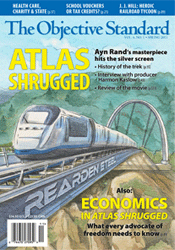 Here it is, the PDF version of my newsletter, Free Enterprise. I am so proud. This will do its part in halting the advance of collectivism and forwarding the philosophy of freedom.